Originally published in dislocate (2010), at the University of Minnesota. 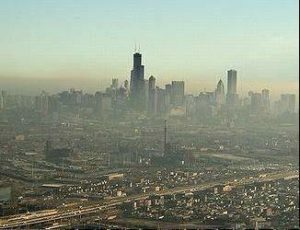 The image of Chicago presented on most conference programs, tourist pamphlets and promotional posters is a photograph of the famous skyline, shot from somewhere out over the deeps of Lake Michigan. In these wide angle portraits, the Sears Tower and the John Hancock Buildings are fraternal twins, each a third of the way in from the outer edge of the lit-up cluster, seemingly holding up the glassy herd of the Loop. I grew up loving this view as much as any Chicagoan, and for a while, the summer I was nineteen, I rode the bus or the train into that center herd five or six days a week, to work at the Exchange National Bank— but I would be lying if I said that glossy skyline was my home. I lived instead in the shadow city, the industrial suburban region that stretches south and east from the ports to the mills of Gary, Indiana, a region not likely to show up on any conference brochure. The streets and houses where my family resided were nice enough, first a brown brick bungalow, then a red brick ranch, but we were never far from some smoke stack or slag pile or waste dump. I share this behind-the-scene scenery because I believe, as a nonfiction writer, my job is to describe both the shadows and the scintillation. I don’t intend—this time—to make a point about the frenzied, lit-up stage set of the center that would fall down without the invisible gray scaffolding behind, nor do I intend—this time—to take note of the damage done to this swath of land, once the tallgrass prairie but now scorched and soldered down to its bones, memories of the prairie springing up wild between the ties of 34 the railroad tracks or in the names of area businesses—Prairie Cleaners, Prairie Bank and Trust, Prairie Tire and Auto. Nor do I mean to write up another scene featuring my father and me, sharing statistics, projections, memories and fears about toxins that may have leached from this landscape into our bodies. Rather, I want to describe to you the business of carrying the un-seeable essence of the shadows onto a nonfictional page with a breadth no less than that skyline view—one tower with a footprint deeply embedded into the ground of this city of lit-up exteriors and gravel-gray soul, another tower set into the imaginative and resonant intelligence of lyric language—that which will not just describe the confidential and promotional aspects of this city, but will also attempt to puncture notions of the Midwest as a landscape of absence, rupture the bright skyline posters with the smoke-spewing semi-truck of the industrial Midwestern urban real. If one of the functions of creative nonfiction literature is similar to that of any of the documentary arts—to invite readers to look at what they might otherwise turn away from, or never encounter, then one of the strategies of invitation is the lyric mode, or that compression of language and container which evokes the poem-like jolt of awareness. The way into the lyric of the commonly unseen is through the tiny lingering details of beingness expressed through the breath of some particular human life inhabiting some fissure of location. The way into the urban unseen, or at least the urban unseen of my experience, is the evocation of the corporeal meeting the industrial. What is the quality of air? What is the taste in the mouth? What is the sound, the song of this moment? For instance: when I was girl we lived across from a tangle of tracks and truck routes, under a sky made silver-gray from the smoke of the steel mills and paint factories 35 of the far southeast side of Chicago. I didn’t always notice the wincing stench in those years before the Chicago mills shut down, except when it got worse, on the way up to 103rd and Torrence, Mom’s old neighborhood where her mother still lived, just a block from their old Projects, around the corner from Wisconsin Steel. “Rotten eggs” my mother muttered, when I was six or eleven or fifteen, as we drove past the slag heaps and landfills along what was then still called the Calumet Expressway, her powdered nose crinkling. She’d told us many times—sulfur from the mills smelled just like rotten eggs. I could see Mom’s profile from the back seat of our blue station wagon, her downturned lips, wrinkled nose, the tower of brown beauty parlor hair, re-poofed every Friday afternoon. All the women we knew in the lower-middle-class steel mill suburbs of Riverdale, Dolton, Harvey, in those days before shag haircuts and handheld hairdryers, attended, devoutly, the weekly communion of the beauty parlor, where Sandy the hairdresser ratted an extra six inches onto their height, then consecrated them with hairspray, as their daughters waited in padded, bronze hair dryer chairs, paging through Photoplay and Modern Screen, deciding who to be when we left. Mom complained about the stench as if she hadn’t smelled those eggs her whole life. Yet she repeated the words “rotten eggs” with the authority of the devoted, muttering a prayer cycle, the hypnosis of repetition, the American sacrament of knowing, yet refusing to know, her blessed devotion to familiarity. Dad drove. Headlights swept the leveled prairies and fouled wetlands of the southeast side, lighting up Mom’s muttering. My brothers shoved each other. Holy. 36 Rotten. Holy. We knew, but could not see, the lights of the Loop, twittering. This night we would not ride that far north. Moments like this one matter to me as a writer not just because the car ride into and out of the industrial plain is an actual and continuous memory of many of our Midwestern urban childhoods—as is the sweet sticky smell of the hairspray from a pink can, and the Photoplay pictorials of Liz Taylor with a scarf in her hair, and the twilight glow of the mills and that stink that did smell like either bad eggs or the devil—but also because that moment links me to the history of cities, of mills, of class and ethnic identities, of human migration, of industrial pollution, as well as the subsequent attempts of the post-steel city to re-green itself, and my own attempts, and the attempts of so many like me, another generation of American re-inventors, to re-green ourselves.